03:45:00 Makes 16 servings, 1 piece (73 g) each. 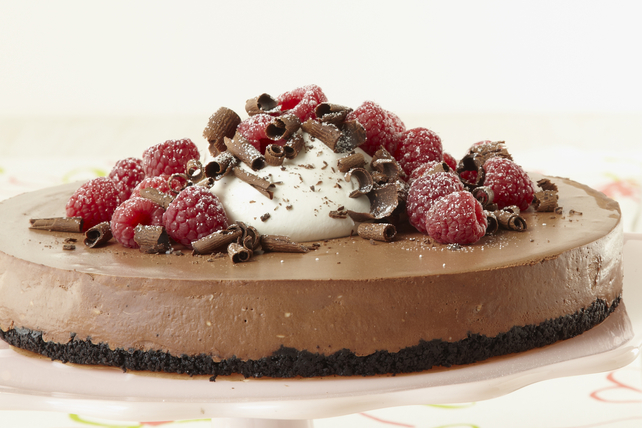 A must-try for chocolate lovers! Sprinkle gelatine over milk in medium bowl. Add 7 oz. chocolate. Microwave on MEDIUM 4-1/2 min. or until milk is very hot. Stir 2 min. or until gelatine is completely dissolved and chocolate is completely melted when stirred. Refrigerate 15 min or until cooled and slightly thickened. Beat cream cheese in large bowl with mixer until creamy. Gradually beat in 1/3 of the gelatine mixture. Add remaining gelatine mixture; mix well. Gently stir in 1 cup Cool Whip; pour over crust. Refrigerate 3 hours. Meanwhile, grate remaining chocolate square; set aside until ready to use. Run knife around rim of pan to loosen dessert. Remove rim. Top dessert with remaining Cool Whip, raspberries and grated chocolate. Sprinkle with sugar. For best results, make sure the gelatine is completely dissolved in the chocolate milk mixture before adding to the cream cheese. Substitute fresh strawberries for the raspberries. Microwave remaining chocolate square on MEDIUM 30 sec. (Chocolate square should just be slightly softened.) Grate chocolate with a vegetable peeler to make shavings. Prepare using skim milk, Philadelphia Light Cream Cheese Spread and Cool Whip Light Whipped Topping. Desserts can be part of a balanced diet but remember to keep tabs on portions. Serving Size Makes 16 servings, 1 piece (73 g) each.